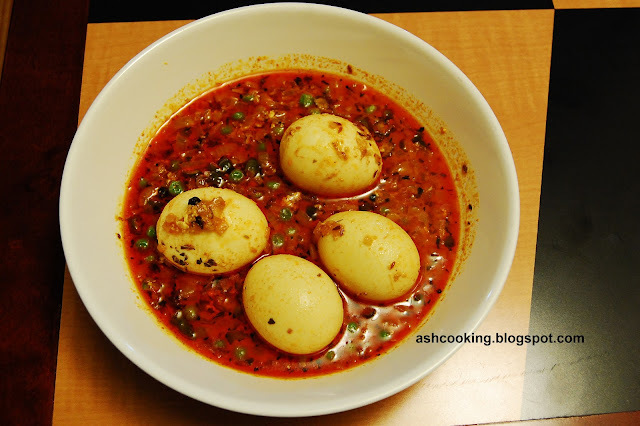 Now that my hubby is back to me safe and sound, I am gearing myself up for concocting an array of his favourite dishes, one of which is the egg curry detailed below. Since he belongs to a family of severe heart patients, his cholesterol level tends to be on higher side no matter how conservatively I plan his diet. 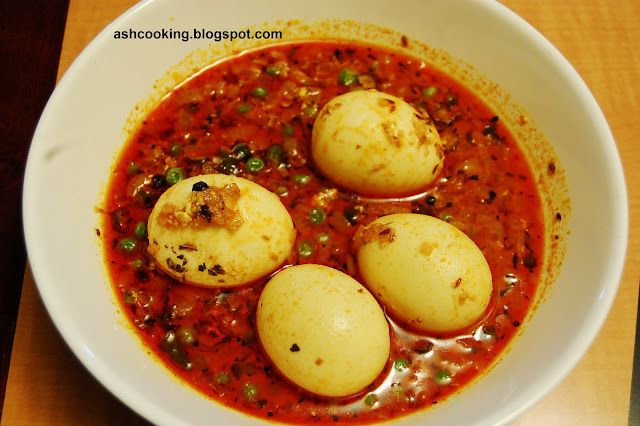 The egg curry might look very spicy but trust me; the red color has come from the use of a wonderful kashmiri red mirch 1/2 tsp of which lends a robust color to any bland dish. I add hotness to my cuisines by using green chillies because that's a healthier option. 1) Heat oil in a wok. Add the ingredients for sauté when oil turns smoking hot. Allow them to crackle. 2) Add chopped onions and fry them till they turn golden in color. 3) Add ginger paste and all the spices. Sauté till oil floats on the surface. In case the mixture turns dry, add few tbsps of water. 4) Toss in the green chillies and peas. Stir around and add yogurt. Mix in properly and let the gravy simmer on medium heat. About this time, measure out water as per your preference for gravy. 6) Seconds before turning the flame off, sprinkle the dried basil leaves. It adds an extra flavour to the juice. 7) Enjoy with hot steaming rice. Yummy!! I am sorry to hear about your husband health problem. If he has high blood pressure and high cholesterol, please do not cook eggs for his meal. While egg white is low in cholesterol, egg yolk is full of cholesterol. As I am too suffer from high level of LDL, I stay away from egg yolk , shrimps, cheese etc. Sorry for the typos in my previous e-mail. As I was writing to you,I got distracted and did not check what I wrote. Sorry to learn about your husband's health problem. If he suffers from high cholesterol and blood pressure, eggs are not good for his health. While egg white is low in cholesterol, egg yolk is not good at all for people who have high LDL. I too suffer from high LDL and I was advised by my physician to stay away from eggs, cheese, shrimps, red meat etc. Olive oil lowers cholesterol. Also, canola oil can be used in cooking. Thanks for stopping by. I know egg yolk has cholesterol, but my hubby's LDL is yet not that high to be scared of. It's because of his belonging to a family of heart patients, I always stay extra cautious with his diet and recently he has gained about 5 kgs of weight. So his cholesterol level increased just a bit from the normal. Doctor has advised him to work out daily and stay away from red meat which he already does. Eggs, shrimps are his favourite and the doctor didnot say anything against them. Infact he told us that with regular exercise my hubby can eat anything he wants even red meat on occasions but in a restricted amount. I use olive oil in cooking some dishes, but as you might know olive oil should not be used for deep frying, so I toss between canola and mustard oil usually. Anyway, thanks for your advice. I really appreciate it.